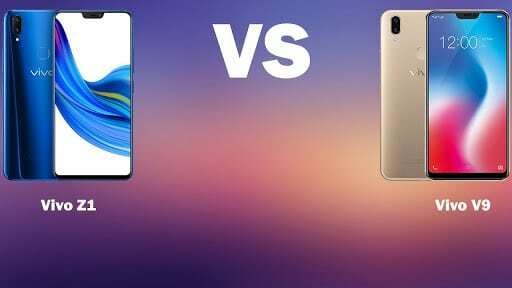 Vivo Z1 VS Vivo V9: Mid-range siblings from Vivo. Chinese phone maker, Vivo is the fifth largest phone maker in the world. The company specializes in the mid-range and budget segment of the market. 2018 has been quite a busy year for them as they saw substantial growth in market sales towards the end of 2017. Vivo has released a couple of mid-range and budget smartphones so far in the first half of the year. For the purpose of this article, I’ll be looking at the Vivo Z1 and Vivo V9. The Vivo Z1 is the first smartphone under the Z-series, so we can expect more from the series in the coming months. These two smartphones are among the best mid-rangers from Vivo in 2018. The Vivo V9 is more of a camera-focused smartphone while the Vivo Z2 is a performance-based smartphone. Both the Vivo Z1 and Vivo V9 are available for under $400 and can be classified as higher mid-range devices. Let’s find out which one of them is the best in quality-price ratio. There’s no clear difference between the Vivo Z1 and Vivo V9 in terms of design. They both feature a front glass, aluminum unibody, rear-mounted fingerprint sensor and a dual rear camera set-up in a vertical direction at the top left corner. Below their fingerprint sensor is the Vivo brand name. At the front, is a top-notch display, the notch houses the speaker grill and the front camera. The Vivo Z1 is available in Red, Blue, and Black body colors. While the Vivo V9 comes also in three body colors option; Gold, Black, and Sapphire Blue. The Vivo Z1 and Vivo V9 measure exactly the same 154.8 x 75.1 x 7.9 mm in dimensions. The Vivo Z1 weighs 149.3 grams while the Vivo V9 weighs 150 grams, it’s safe to say their weight is virtually the same also. The screen technology on the Vivo Z1 and Vivo V9 is an IPS LCD panel. The display of the Vivo Z1 features a 6.26-inch screen size, an 84.1% screen-to-body ratio, 1080 x 2280 pixels resolution, 19:9 aspect ratio and 403 pixels per inch density. While the display of the Vivo V9 features a 6.3-inch screen size, an 85.2% screen-to-body ratio, 1080 x 2280 pixels resolution, 19:9 aspect ratio and 400 pixels per inch. Just like the design, the Vivo Z1 and Vivo V9 have similar display features. The dual rear camera of the Vivo V9 consists of a 16MP primary sensor, a 5MP secondary sensor with f/2.0 aperture and dual-LED flash. While on the Vivo Z1’s dual rear camera is a 13MP primary sensor, a 2MP secondary sensor and LED flash. The Vivo V9 clearly has the edge in the rear camera set-up. But that’s not the case at the front, as both the Vivo V9 and Vivo Z1 features the same 24MP front-facing camera with f/2.0 aperture. That’s a win for the Vivo Z1 in my opinion since it’s a category the Vivo V9 should dominate. The Vivo Z1 houses Qualcomm Snapdragon 660 chipset, Adreno 512 graphics processing unit and an 8-core processor clocked at 2.2GHz. While the Vivo V9 houses Qualcomm Snapdragon 626 chipset, Adreno 506 and an 8-core processor clocked at 2.2GHz. The Qualcomm Snapdragon 660 chipset is one of the best mid-range chipsets from the company and is better than the 626 chipsets. The Vivo V9 and Vivo Z1 run on Funtouch OS 4.0 skin, which is overlaid on top Android 8.1 Oreo. They both come with a standard 4GB memory with 64GB internal storage, which is expandable up to 256GB through microSD. Both the Vivo Z1 and Vivo V9 packs a non-removable Li-lon 3260 mAh battery. Sadly, no fast battery charging feature for the Vivo V9 and Vivo Z1. Although their respective chipset supports fast battery charging, Vivo obviously didn’t allow that. The Vivo V9 will cost you around $350 (N122,500) while the Vivo Z1 goes for around $353 (N123,550). The key difference between the Vivo V9 and Vivo Z1 is the camera and hardware. The hardware is always very important in a smartphone, which is why I would choose the Vivo Z1 over the Vivo V9. DONT MISS: BlackBerry Key2 VS BlackBerry KeyOne: any major differences?